Home energy is one aspect that most people find very tasking. We understand this. However, we also understand that energy is a one thing that drains the home and your pockets. As a result of this, we have found that making simple changes in your home or even simply upgrading in the slightest way would greatly improve your home energy. Here is a list of the Top 5 Home Energy Tips you can start applying today to improve your home energy. When the weather stripping around your windows and doors are old or cracked, it tends to cause a lot of energy and heat loss. In order to curb this loss, you may want to check the weather stripping around your windows and doors annually, to be sure that it is not suffering from wear and tear. You may also want to check your thresholds to make sure that it is properly and tightly sealed with the door. If the weather stripping on your doors and windows are worn, you can easily get a good replacement at any hardware store. 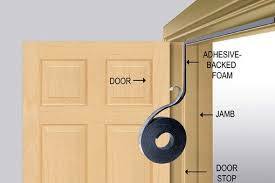 Do not be afraid, they are not expensive and they are quite easy to install. As a matter of fact, you can install them on your own; all you need is a pair of box cutters to cut them into the required lengths, expose the sticky side by peeling off the back, and just stick it on. When it comes to home energy conservation, hanging on to old and less energy saving appliances are a huge mistake. You may not realize it, but your worn out appliances are costing you energy and money. Then water heater is typically at the top of this list of appliances; as it is the second largest appliance that consumes energy in the home. This may be closely followed by your refrigerator, washing machine, dryer and even light bulbs. We know that, replacing all of these high energy consuming appliances in your home at once can punch a really deep hole in your pocket so, here is what you can do instead. Without insulation in your home, you can end up losing an insane amount of energy. Fiberglass or cellulose are fantastic insulators especially if your home is a modern one. They are both superb at trapping heat and, the great thing is that they can last you a lifetime upon initial installation. However, should you be looking to remodel and thereby add insulation or, you find that your previous insulator is not working quite as well anymore, then, an upgrade is just what you need. Before you choose either one of these fantastic insulation, you may want to first do your research on both of them and figure out which is best for you and your home; in terms of cost, how easy it is to install, and durability. You can also however, decide to choose both. If you decide to carry out this project on your own, be sure to have your safety gear. Always wear overalls, gloves and safety glasses. Also, be sure to have a respirator that is fitted with the appropriate kind of vapor filter; you do not want to keep breathing in these insulators for an extended period of time. According to the department of energy, windows tend to let out way too much heat. They can even account for a large amount of your heating or cooling bills. Now, replacing your windows may be expensive, but, in the long run, getting energy efficient windows would save you a lot of money, and energy that could have been lost. Apart from just saving you money and energy, energy efficient windows will also increase your home value and overall curb appeal should you decide to sell. We know that heating and cooling of a home can be quite energy consuming and costly; so, what better way is there to manage your energy and bills, than managing the heating and cooling of your home? A smart thermostat is an excellent way to begin. The great thing about a smart thermostat is, it has the ability to learn your habits. This means that, based on your habits, the smart thermostat can anticipate when you are most likely to be home and adjust the temperature accordingly. This is one energy saving investment that you would continue to thank yourself for. It allows you not only to save energy and money, but to be comfortable while at it. Saving energy in your home is a big deal. It is also saving money and being eco-friendly. These top 5 tips are mostly cost effective and even those that are not, have cost effective alternatives available. They are also mostly DIY tips; so you can save up on installation costs. Would you not want to take charge of your home energy today? Use these tips and start now to make the necessary changes to help you save your energy and save your money in the process.